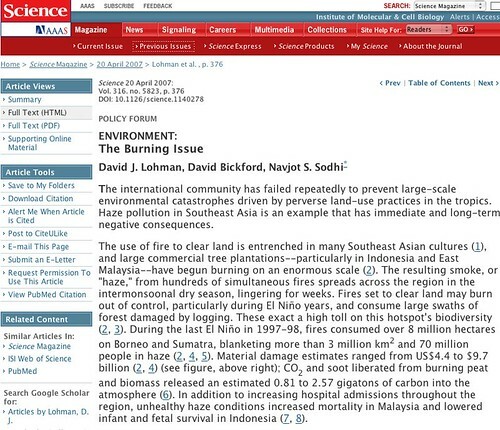 Policy forum article on the Asian haze crisis appeared in this week’s Science. “The Burning Issue,” by David J. Lohman, David Bickford, Navjot S. Sodhi. Science, 316 (5823): 376 (20 April 2007); DOI: 10.1126/science.1140278. Note the link to supporting material – a pdf of selected bibliography of papers on fires and haze in South East Asia from the ISI Web of Knowledge in January 2007 and from references cited therein. The references are arranged chronologically by subject.